Changing World Technologies Inc. is changing the energy world in its own way, producing more than 250,000 gallons a month of renewable diesel from a refinery in Missouri that uses poultry parts for its feedstock. Sometimes creating alternative energy is actually all about creating synergy. Brian Appel, chief executive officer of Changing World Technologies Inc. (CWT), knows that first-hand. In recent years, the West Hempstead, New York-based company has had partners, such as agriculture industry giant ConAgra Foods Inc. and major supporters like Daimler-Chrysler, Ford and GM. Added to that is research and development support from industry association, the Gas Technology Institute, and financial support from blue chip investment firm Goldman Sachs & Co.
"It's been great to have the resources all the different companies bring to the table," says Appel. "We've had collaboration from each of the different industry streams we are doing research and working in. A lot of people have been supporting what we are doing simply because companies want to reduce their energy bills and their waste disposal costs. "These companies all have people assigned to those tasks," explains Appel. "We've leveraged what we are doing at CWT with those skill sets to have a bigger, faster impact. We only have about 90 employees at CWT, and people wonder how we get so much done--well, it's all about leverage." And synergy. That--plus about $100 million in research and development investment and years of work--has, for starters, produced an energy refinery in Carthage, Missouri that is now shipping more than 250,000 gallons (6,000 barrels) of renewable diesel fuel a month. That figure represents only about 30 percent of the plant's capacity. 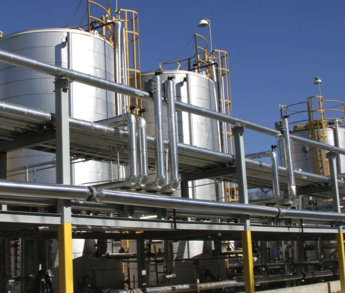 Changing World Technologies' waste-to-oil subsidiary, Renewable Environmental Solutions (RES), which oversees the refinery, was a joint venture with ConAgra Foods. RES itself was established in 2000 as the exclusive vehicle for processing agricultural waste material utilizing CWT's Thermal Conversion Process technology. The company says the quantity of oil that RES currently supplies to the market makes a small, but significant impact in helping the U.S. to meet its energy needs, utilizing domestic, renewable sources. CWT sees the refinery as a step towards energy independence--helping to reduce the reliance of the United States on foreign oil supplies, while creating an economically viable solution for the disposal of waste. The type of waste explains ConAgra's involvement and the location of the refinery in rural Missouri. The feedstock for the facility includes chicken parts, turkey feathers, turkey fat and, sometimes, whole chickens and turkeys from ConAgra operations. This area of southwest Missouri, Appel explains, has one of the largest concentrations of livestock--in this case, poultry--in the world. "The region has a highly concentrated animal and agricultural related business. It's also in soybean country and that provides rancid oils that we can also process. Our system is very forgiving--the pipes don't distinguish between what types of fats, proteins or carbohydrates are feeding it. It doesn't care if it is from an oil crop seed or an animal source." How does it all work? At the start of the process, the animal or plant material is trucked to the plant from the various ag facilities in the area. It then goes through a depolymerization step. "It's a big word and that may sound scary, but in our world what it means is separating the organics and the inorganics," explains Appel. Any metal, for example, that has made its way into the waste stream is removed. Changing World Technologies' $40 million refinery (in photos at left) in Carthage, Missouri, is now shipping more than 250,000 gallons of renewable diesel fuel a month. The material is then hydrolyzed to make the renewable diesel. In hydrolyzing, the process breaks the material into different components. In the case of fats, for example, they want to eliminate the glycerol. "Water does a really good job of doing that," says Appel. "There are a number of other downstream processes that clean up the material and separate it." Essentially, the company breaks down long chains of organic polymers into their smallest units, and reforms them into new combinations to produce clean solid, liquid and gaseous alternative fuels and specialty chemicals. Appel notes that the process emulates the earth's natural geothermal activity, whereby organic material is converted into fossil fuel under conditions of extreme heat and pressure over millions of years. 1. Pulping and slurrying the organic feed with water. 2. Heating the slurry under pressure to the desired temperature. 3. Processing the material in the de-polymerization reactor; separating the organic from the inorganic fraction. 4. Processing the organic material in the hydrolysis reactor; splitting complex molecules into smaller units. 5. Separating the end products. The $40 million demonstration refinery was built by Kvaerner Process Systems of Calgary, Canada, and Tindle Construction. Kvaerner also built CWT's Philadelphia research and development facility. The system may look relatively straightforward, but the multiple steps on the way to producing renewable oil, Appel notes, can be tricky. "The reason why we are successful and why we have such high energy efficiency is the multiple steps, so that we wind up with clean product streams. "Some companies try to do things in one process or reactor, such as with gasification or incineration. You can end up with ingredients you don't want in there--if things get complex--and it can be hard to sell the product." Even though it had done years of work at its Philadelphia R & D facility, the company still had a learning curve with the Carthage refinery, and the depolymerization and hydrolysis that are key parts of the refining process, not to mention the raw material itself. "This is not just the hydrolyzing of fats that has been done for many years. We have a much more complicated mix--we call it nature's soup--that we are dealing with." But the end result is a fuel that industry can apparently work with. CWT has already done tests using the fuel to fire engines to generate electricity at Carthage Water and Electric, though it is highly blended. "We are moving towards a straight-run fuel," adds Appel. "We can also take the oil we produce and, unlike other renewable fuels, upgrade it into other products, like jet fuel, because it does not contain alcohol. Refineries don't hate the carbohydrate economy--that is a myth. They just hate alcohol because it fouls up their catalysts." The oil currently being produced is being sold to a local oil blender and to customers who use it as a heat source for their operations. Appel says that their source of supply for this complex process--in the form of a variety of waste materials--is readily available, in both North America and in Europe. "Our whole focus is on dealing with waste and converting it to energy, and there's an awful lot of BTU's available in that waste. We stay on the side of low value streams for industry and convert that to renewable diesel and other co-products." With the Missouri plant, the co-products include fertilizer. While the Carthage plant is using animal waste, the company's Thermal Conversion Process can also use tires, plastics, oils and municipal waste as feedstock, opening up huge potential supply streams. It's been almost 10 years since Appel founded CWT, and seven years since he set up the R & D facility in Philadelphia. With that set-up, and the Carthage facility up and running, CWT is now at the point where it can roll out its technology in a greater way. "It's not something that is going to come--it's here now, and we can make a dramatic impact now," he says. The type of impact Appel has in mind, in part, explains Changing World Technologies' name. "Changing the world is exactly what we are trying to do." They are, predictably, running up against obstacles in changing the world, notably from the conventional energy industry, and a lack of government support. Appel notes there is huge potential for these types of alternative energy systems, but there is a lack of parity in the energy industry--and government policy--in the United States. "The hidden costs in the extraction and delivery of oil are enormous--there are subsidies of up to five dollars a barrel for fossil fuels. We're really up against this oil addiction." Those subsidies can range from the tax breaks individual energy companies get to the credits for building oil pipelines in Alaska. "There are no breaks out there for building ethanol pipelines from Iowa to California or from Illinois to New York. It really is preposterous." In his State of the Union Address earlier this year, President George Bush noted America's "addiction to oil"--and the danger of being dependent on foreign produced oil. Since then, the government has made some moves to encourage alternative energy production. But very little has actually changed, says Appel. "I really don't know how meaningful that was. It certainly got people excited but I don't know how you monetize what was said by the president. The same laws and rules apply now as they did before. There are no incentives or tools to backstop the challenges of taking on something new in energy. You have to put programs in place, and these are not handouts or subsidies. I'm talking about programs that give parity to the system." The tax incentives that are in place for alternative and renewable energy, says Appel, are short in duration. The Missouri plant receives a dollar a gallon, but that is only through 2008. "The U.S. has chosen to limit the incentives," says Appel. "But if I go to Germany, I can get a 20-year power purchase agreement, backstopped by the German government on a renewable energy program." Which explains the direction the company may be taking in the near future. They are currently finalizing the design for a new 500-ton-a-day refinery that will--quite possibly--be going overseas. "There are two reasons," explains Appel. "One is that except for the U.S., most of the world has banned feeding animal material back to animals. That material which is now turned into feed in the U.S. is actually a waste material just about everywhere else. And you get paid for the proper disposal of that waste." By doing this, CWT points out that it is also able to reduce the risk to human health from exposure to Mad Cow Disease, and other health threats, by diverting these animal proteins away from the food chain into industrial products, and destroying suspect proteins. The second reason is what Appel referred to earlier: that there are economic supports and incentives in other countries--like the power purchase agreements in Germany and renewable energy obligation certificates in the U.K.--which promote long-term renewable/sustainable energy technologies. Appel's preference would be to set up the new facility in the U.S. But there needs to be a real shift, on the part of the government, towards supporting alternative energy production. And if that does happen, Appel says, look out. "If there was a leveling of the playing field and parity in the energy system, you would see the supercharging of sustainable and renewable energy efforts like we have never seen." The shift, he notes, would be on the order of scale of the U.S. moving from coal to oil more than a hundred years ago. "If that happened, we'd need strings to hold us down." This kind of change would unleash innovation and encourage capital investment on a massive scale. In the near term, regardless of where the new refinery is located, in the U.S. or abroad, CWT also plans to expand its Carthage plant. "It's a production facility, but it's also a training center for us, and we still have some research and development to do." When it comes to doing the staffing for any new facilities, they want their people to train at a real operational center, in Carthage, rather than just on computer equipment. "One issue today with the new plants is that things are done with virtual design and there are a lot of mistakes that can be made with virtual design. And we'd like to avoid them."